But Trump saw little damage during his visit to Corpus Christi — mostly boarded-up windows, downed tree limbs and fences askew. And that was through the tinted windows of his SUV as his motorcade took him from the airport to a firehouse in a city already nearly back to normal. The president deliberately kept his distance from the epicenter of the damage in Houston to avoid disrupting recovery operations. Trump also visited Austin during Tuesday’s trip, when he met with officials at the state emergency operations center. Gov. Greg Abbott, R-Texas, said Trump showed “genuine compassion” on the short flight to Austin as they watched video footage of the flooding in Houston. “The president was heartbroken by what he saw,” Abbot said. Trump plans to return to the region Saturday to survey the damage and meet with some victims, according to White House press secretary Sarah Huckabee Sanders. Trump pledged that his administration would work tirelessly to help the region recover. “We are going to get you back and operating immediately,” Trump told a crowd outside a Corpus Christi fire station about 30 miles from where the storm made landfall Friday. Trump was eager to get the federal disaster response right. But he missed clear opportunities to strike a sympathetic note for the multitudes suffering. The president did not mention those who died in the storm or those forced from their homes. He basked in the attention of cheering supporters outside the fire station where officials briefed him on the recovery. Trump is clearly determined to seize the moment and show a forceful response to Harvey, mindful of the political opportunities and risks that natural disasters pose for any president. Trump has been dogged by low approval ratings and self-created crises. 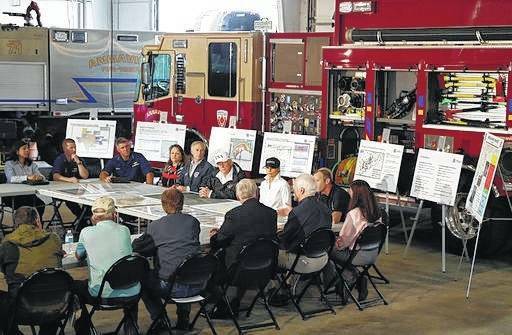 It’s long been presidential practice to avoid visiting the most devastated areas of a natural disaster while recovery is still in the early stages, to avoid getting in the way or diverting critical resources. In Texas, residents seemed to understand. Before Trump landed in Texas, Louis Sirianni arrived at his beach house in Rockport, about 20 miles outside Corpus Christi, to assess damage. Sirianni said he appreciated Trump’s gesture and understood why there were no plans to take him into the hardest-hit area. “He’d see enough if he came along here in a helicopter,” Sirianni said on a balcony accessible only by a 12-foot aluminum extension ladder. The president, during his stop in Austin, said it was a “sad thing” that the recovery would be a “long-term” operation. His largely upbeat reassurances about a speedy recovery, though, stood in contrast to the more measured assessments coming from emergency management officials. There’s a long, difficult road ahead in recovering from a storm whose flooding has displaced tens of thousands, those officials have cautioned. Trump’s promise of swift action on billions of dollars in disaster aid is at odds with his proposed budget. It would eliminate the program that helps Americans without flood insurance rebuild their homes and cuts grants to help states reduce the risk of flooding before disaster strikes. President Donald Trump, flanked by Texas Gov. Greg Abbott and first lady Melania Trump listens during a briefing on Harvey relief efforts Tuesday at Firehouse 5 in Corpus Christi, Texas. https://www.delgazette.com/wp-content/uploads/sites/40/2017/08/web1_TRUMP-TEXAS-083117.jpgPresident Donald Trump, flanked by Texas Gov. Greg Abbott and first lady Melania Trump listens during a briefing on Harvey relief efforts Tuesday at Firehouse 5 in Corpus Christi, Texas.